I can't even count the number of times I've read/heard the phrase "eat more dark green leafy vegetables." It's everywhere. They form part of Canada's Food Guide. My favourite magazine, Clean Eating, is always touting their benefits. Most lists of so-called 'superfoods' (in quotation marks because this is not a licensed or regulated term, so always take it with a grain of salt) have spinach featured pretty prominently too. BUT, there are a few issues that can come up with spinach (and other leafy greens). First off, when eaten raw, it's hard to eat enough of these vegetables to really benefit from their nutrients. 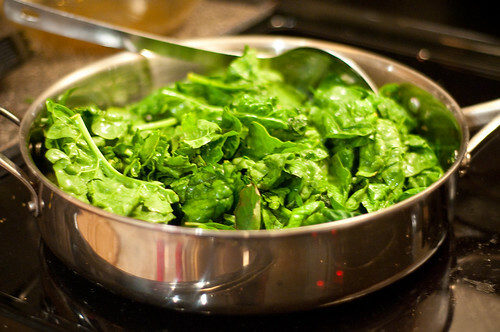 For example, 1 cup of raw spinach has 7 calories, 1 g fibre. It's a great source of Vitamin A (56% daily value) and Vitamin K (181% daily value). That's pretty good. When you compare with 1 cup of cooked spinach, you get 41 calories, 4 g fibre, 5 g protein (who knew??? ), and the news gets better with some of the other nutrients - 24% daily value for calcium, 36% daily value for iron [make sure you consume with a vitamin C source to optimize your absorption]. PLUS, 1 cup of cooked spinach is a pretty good sized serving. You won't feel at all satisfied with 1 cup of raw spinach, but the same size serving of cooked spinach will definitely help fill you up. My other problem with spinach is that I end up buying a big plastic tub of it, and if I'm not cooking it, it ends up going bad, because we can't get through it quick enough. Cooking decreases spinach's volume by nearly 90%, so if you have slightly-sketchy spinach, just cook 'er up, eat it and you're good. And this brings me to my last point about why cooked spinach is better...y'all might think that processed hamburgers might be one of the number one sources for e.coli....but spinach has also been the source of a surprising number of outbreaks. 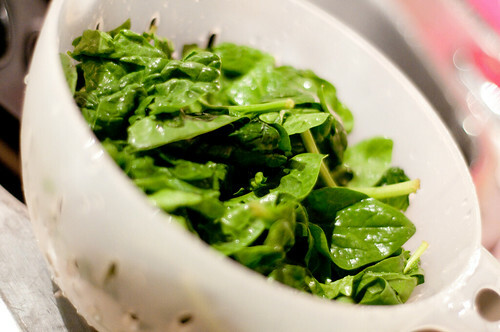 There are some tips here on how to safely handle spinach, but the reality is that you can't wash off e.coli. You can kill it by cooking though. One other quick tip about spinach - it has been named as one of the 'dirty dozen' most contaminated vegetables. So if you can find organic spinach, it's probably a better choice. You can see the whole list of the most and least contaminated veg/fruit on the Organic.org website. Just something to think about. So....now that we've got all of the pleasantries (???) out of the way, let me tell you about dinner. Hubs and I didn't end up eating until 11 last night (Lil Z got some leftover beef stew, made from this Clean Eating recipe). I had *thought* we would be eating around 10, so my chicken was a little dry, and my parsnips a little tough....but they were still tasty, and the recipes are absolutely yummy, so I'm sharing, even though you can clearly see the dried-out execution of the meal on the plates (pics don't lie). 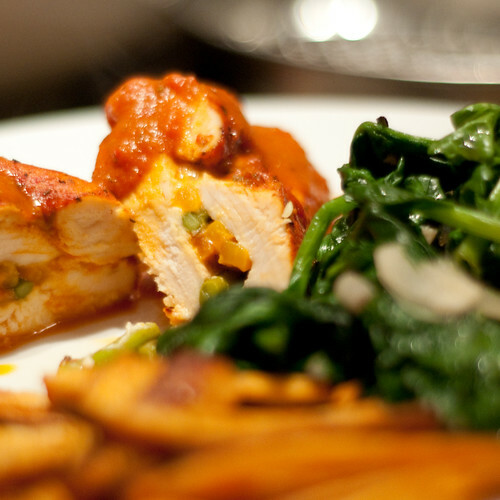 This chicken recipe is from (surprise, surprise) Clean Eating. A couple of small mods due to availability, but overall, the taste is great. I think the roasted pepper sauce would be amazing on pasta. 1. Preheat broiler. 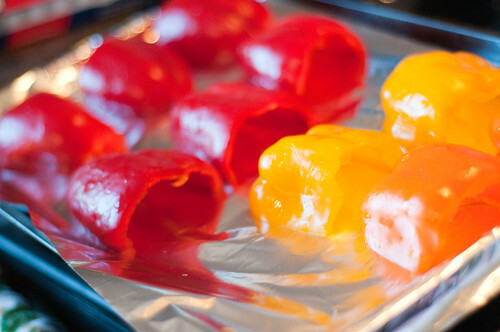 Cut peppers in half, and arrange, cut side down, on a baking sheet. Place as close to the broiler as you can (don't be scared!). Broil for 10-ish minutes. You want them completely burnt. Start checking after 7 minutes. Once they start smoking, then they are probably ready. Immediately put them in a bowl and cover with plastic wrap. Let them steam themselves for about 10 minutes....this makes it easier to remove the skin. (NOTE: if you don't burn the heck of the peppers, the skin will be near-impossible to remove and you will hate me. So burn the peppers, k?). 2. 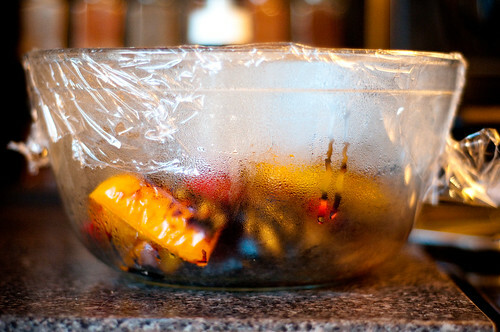 Once the peppers are cool enough to handle, remove the skin. It's okay if there's still a little black on 'em though. That makes it yummier. (NOTE: If you are lucky enough to have a gas stove, you can do this stove top. Or you can do it on the bbq. Or you can use jarred peppers....really doesn't matter to me!). 3. Take 2-3 peppers and put them in the blender (as mentioned, my peppers were small, so I used 3 small peppers in the sauce. If yours are big, you'll only need two). At any rate, keep one pepper behind to use to stuff your chicken. 4. In the blender, add the oil, vinegar, broth, garlic and hot pepper. Blend until smooth. Put sauce in a small sauce pan over medium-low heat, add italian seasoning and black pepper (and salt to taste) and cook for about 10 minutes. This will take the edge off your raw garlic. 5. Meanwhile, lay the chicken on a cutting board. Using a sharp knife and with the palm of 1 hand holding the chicken, cut each breast in half horizontally (knife should be parallel to cutting board), so it opens like a book. 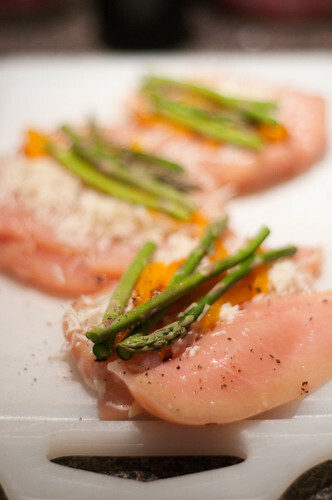 Lay chicken breasts open and spread cheese onto half of each breast. Add asparagus spears, as well as red pepper strips. I used 2 spears per breast, along with 3-4 pepper strips. Close chicken by folding top half back over, sandwiching filling. 6. 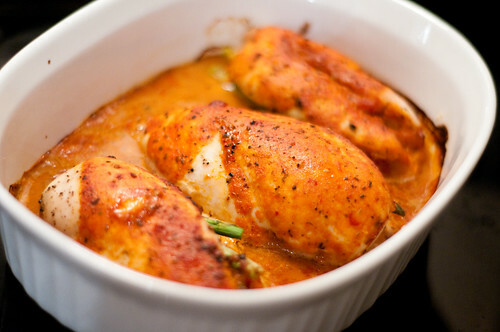 Carefully transfer stuffed chicken breasts to casserole dish. 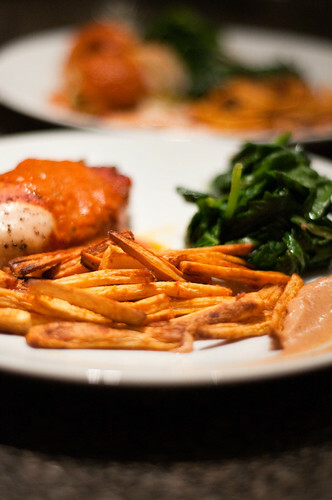 Pour about 1/2 c roasted red pepper sauce over chicken breasts and bake for 35-40 minutes (at about 375F) until chicken is cooked through. (I turned my oven waaaay down once I learned of hubs' tardiness, but mine still dried out, so check your chicken after 35 minutes and go from there). 7. 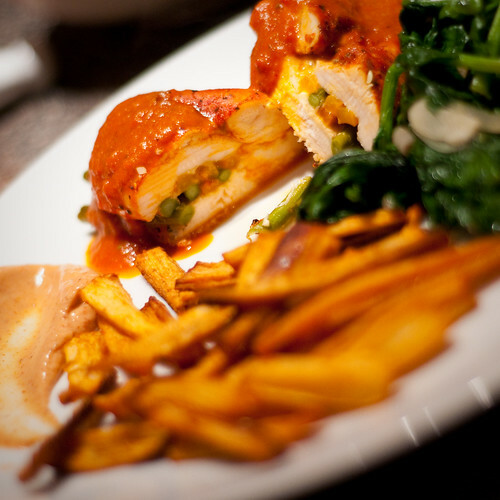 Serve chicken, and pour additional warm red pepper sauce over chicken. Clean Eating nutritional info (per 1 breast and 1/4 cup sauce) - 323 calories, 13 g fat, 16 g carbs, 5 g fibre, 10 g sugar, 34g protein, 512 mg sodium, 77 mg cholesterol. I served this chicken with spiced parsnip fries. 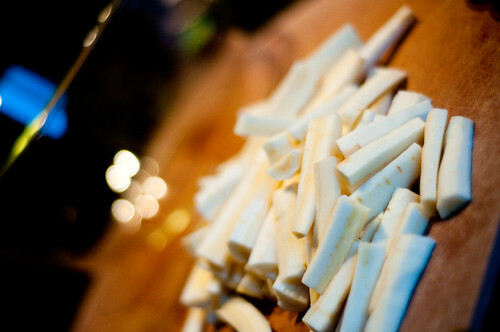 Parsnips are one of the most under-appreciated veggies. I think they are SO delicious...and this is one of my favourite ways to cook them. It's easy and you can serve it as a side dish, or as an appetizer (they always disappear). My mom first made this recipe for my brothers and I when we were teenagers, and I'm pretty sure it lasted about 2 minutes on the table. It's really that good. 2. 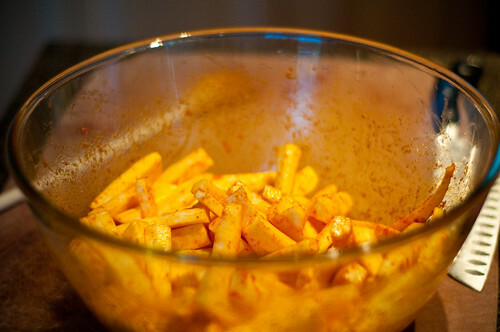 In a large bowl, use a whisk to blend the curry paste into the canola oil (the whisk is really the only way to get the dense curry paste to blend into the oil. This stuff is killer spicy, so you don't want clumps). 3. Bake parsnip fries for about 50 minutes, turning once. I like to put mine on parchment paper, because a) they don't stick, and b) I can toss it and I don't have to scrub a pan. 4. 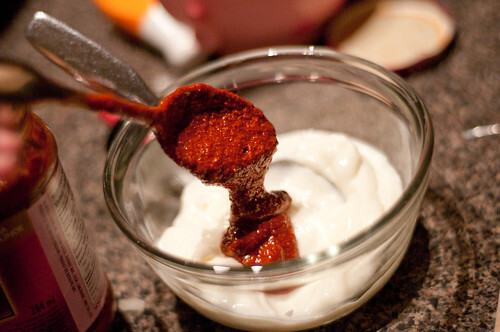 In the meantime, combine the curry paste and light sour cream. You can use any kind of curry paste - I used tikka this time, but I've used mild, hot, vindaloo...even curry powder, garlic and honey in a pinch. But hey, that's how you know this blog is real, right? Last, here is the spinach recipe. This one is from Clean Eating and is deeelish. 1. Heat a large sauté pan. Add oil, let oil heat up. Add garlic and onion and sauté until very slightly browned. Add spinach, basil, salt and pepper and toss for 2 mins (until spinach is wilted). Voila. There you have it. This was a really yummy way to make spinach - the basil really brightened up the flavour and I'd highly recommend it. OMNOMNOM. Sounds so delicious. And easy. I sense this being dinner in the very near future. Thanks! Your dinner looks pretty fabulous. I enjoy the Clean Eating magazine too but wished that I used it more. I love the idea of trying spiced parsnip fries. I also have a number of issues of Eating Well. Found a great Quick Thai Chicken & Vegetable Curry that is my 'move along' spinach go-to recipe. It is on their website. pork and muffins. not at the same time.